Why hand screened ink makes superior graphics? Box printing is a specialty production job. Most printers do not have the capability to print on cardboard because of the thickness of the sheets. When you print on corrugated board, you are printing on a spongy material, not a rigid one. In addition to being light and durable, corrugated board is also easily crushed. 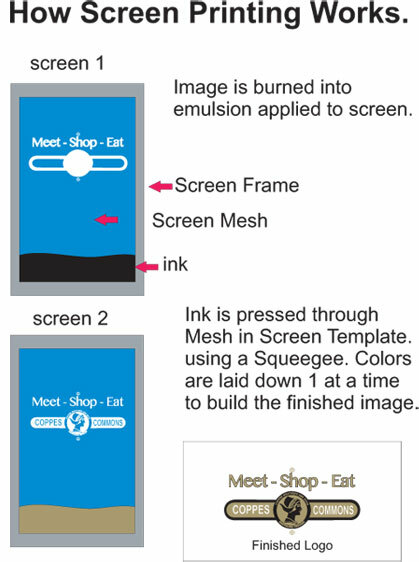 Screen printing is the most vibrant and cost effective method for printing small custom runs. Flexography is relief printing (raised images and letters) done with rubber plates on a press (not an offset press, but more like a letterpress). It provides adequate but not superior quality. Sometimes registration is off a bit. And sometimes on corrugated board, you can see the patterning of the fluted cardboard reflected in the uneven ink lay-down. Litho Lamination is the process of printing your design on a coated press sheet that you then laminate to the corrugated board prior to die-cutting the board and processing it into a box.This option has a higher set-up cost than required for the other methods. Printing Paper Stock from which the corrugated board is made (prior to its being made) is also a process of printing on paper which is laminated. But this sheet becomes part of the corrugated box (like a paper sandwich with the fluting in the middle) and is then die-cut and processed into newly corrugated board into a box. Set-up costs are very high and preprinting is only appropriate for very large production runs – hundreds of thousands of copies. Screen printing is a process by which ink is forced through a screen mesh (made of polyester or other material) by using a squeegee. A stencil or mask allows ink to pass through image areas while blocking out non-image areas. You can lay down a large quantity of ink (providing more saturated colors) on the surface. The overall quality is much higher than that of flexographic printing and also more appropriate for shorter to mid-range press runs. This is the method used by KeepTidy to produce high quality, vibrate color, custom run boxes.